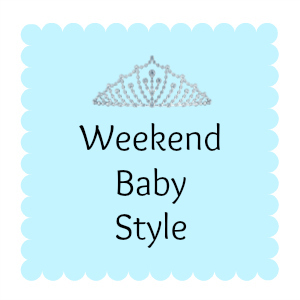 I’ve once again joined in with Sarah and Hannah’s Weekend Baby Style link up. This weekend’s outfit is extra special. It was bought for Rosalie by her Auntie Lucy and Uncle Terry. Uncle Terry picked it out for her in Macys during a recent trip to New York. Its from the first impressions range. Her sparkly shoes were £3 from Matalan. I think Rosalie looks extra cute! If you’d like to enter this link up too you can do so by clicking here.